18. Apr 2019, 15:20 Hallo Gast. I have just read the link you had posted above and I have to say that this theory which is pointed out there does not really make sense at all. The theory skips the problem, that Sauron would surely not count on some drawfs and a Hobbit to defeat one of the mightigest Dragons in middle earth. So what Sauron should have done if those had never tried to recapture the lonely mountain or failed by trying to do so ? It was almost not possible they would be successful. But in the end Sauron is supposed to bulid his whole strategy of conquering middle earth on accidents which he noticed recently . Please this is just absurd. Actually he didn't know Smaug would be killed, he thought Azog or later Bolg would stop the Dwarves, and on the map shown in the site Sauron has intended the Lonely Mountain as a stopping point for his armies sent for Angmar, as he had been in league with Smaug as told in DOS EE. But, on their way, the armies of Azog understand Smaug is killed and change tactics: kill the Dwarves, take Erebor, and then march to Angmar, only to hear by Bolg that the Elves have come to the mountain too, sending him to Gundabad. I know, there are no exact logical theories, but this one seems the most likely to me. - The Dwarves encounter with Smaug (the battle of the forges). Although the action looked freak'n awesome, but it literally makes no sense whatsoever; The whole point of bringing Bilbo is to sneak to the mountain the steal the gem. They were scared to death from Smaug. Why would they ever go YOLO on him!! and then after the ridiculous golden weapon plan, why would Smaug go to kill the poor lake men. The Dwarves were right under his mercy after their "plan" to entomb him failed. I had completely forgotten about that scene (and with good reason, considering how ludicrous it got). I saw many videos and sites on the Internet that also tell the Necromancer is going to question Gandalf about the bearers of the Three Rings of Power before Galadriel comes, I think maybe in these scenes they will make Gandalf see the vision with Smaug through the palantir . they will make Gandalf see the vision with Smaug through the palantir . Just check old threads on Theonering.net - there is a broad concensus that such scene definitely won't be, because doesn't fit there and was supposed to be in DOS after Thrain sequence and before Azog sequence for dramatic effect. But yes, I would like to see as well. But why would they include it in the BOTFA Art and Design book if it won't be in the third movie? Also, maybe the Dol Guldur and Laketown scenes are happening at a different time in BOTFA, so Sauron still shows the vision to Gandalf. There is clear evidence - "Thrain" bonus soundtrack for Botfa which was supposed to be in DOS. At the end is music sequence where probably "Palantir scene" belongs and logically such sequence was completely removed. I don't think we will be seeing any sort of scene of that kind in the EE; it was probably an initial idea that was not implemented anymore in the film, even though it would be interesting to see how it could have been portrayed. Concerning your picture with Gladys after confrontation - yes there is definitely useless cut around two - three seconds. There isn't transformation back to normal form like in the LOTR, but according to soundtrack there is completely the same music sequence. That picture of Galadriel is just a fast photogram, a tiny and little hint of how Galadriel could have been initially portrayed as a bright and ethereal being. ^^Yeah, he might tell a few words about that, it will be a good enough addition to the last movie. But I think we all want(ed) to see the scene with Smaug through the palantir, in DOS or BOTFA My last guess (although still not very possible ) is that maybe we will see this scene in a flashback, like Gandalf tells Radagast or Galadriel what he had seen through the palantir and we see a flashback scene of Smaug, what do you think? - Speaking of unnecessary, why is PJ trying to ship Gandalf and Galadriel? Isn't she already married to Celeborn? This scene, while some might think it cool, makes zero sense to me. 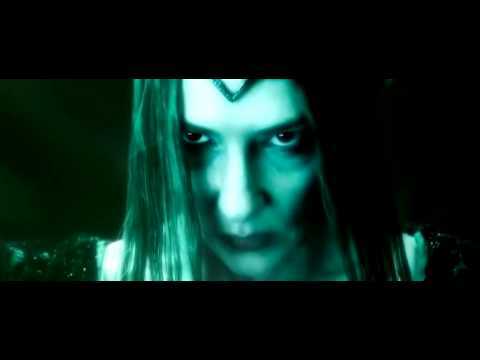 Why is Galadriel becoming all scary in this scene? Is it because she's using Nenya? If so, then why is she turning scary-looking? And WHY WOULD YOU DO THAT IN FRONT OF SAURON? Especially since the Three Rings of the Elves were supposed to be HIDDEN! And why is she wielding the Phial of Earendil? Is that what she's using to banish Sauron? If so, why is she turning scary-looking? The Silmarils, from whence the Phial gets its light, are not evil, and I read nowhere that they were ever tainted by Morgoth or Sauron. It just feels like more of PJ making Lothlorien elves (especially Galadriel) scarier than they were in the books. Galadriel probably met and knew Olórin (the name of Gandalf in Valinor as a Maia) in Valinor, when she used to attend the Gardens of Lórien of the Vala Irmo during the Years of the Trees, and Olórin was indeed a Maia of the People of Irmo; then, in the Third Age, even though the infinite memories of Gandalf as an angel were concealed in his own mind by the Valar, Galadriel has always had a very deep and special relationship with him, because she already 'knew' him and Gandalf was the only Istar that she completely trusted and appreciated the most, knowing really well his brave and pacific nature and wisdom, the reasons he was sent to Middle Earth by the Valar to contest the power of Sauron, and Gandalf was probably naturally 'benevolent' towards her, because she is the only trace left in Middle Earth of the Light of Valinor. And this was, I read, the initial idea of Philippa Boyens, but, as for many other elements of all the Hobbit trilogy, the 'grotesque' view and style of Guillermo del Toro influenced everything and somehow 'forced' PJ's hand to even give the films a general dark, grotesque, ironic and 'creepy' tone, having been him also a director of splatter horror films. I think, nevertheless, that some traces and hints of the previous concept of Galadriel have still remained and are still visible. For example, when she orders Radagast to flee from Dol Guldur and goes 'GO!' or when she turns back to her normal form after the banishment of Sauron (a fast photogram). 2. According to the script of the film, the energy and strength of Galadriel were constantly being drained by the evil atmosphere of Dol Guldur and the powers of Sauron, darkening her and her ethereal aura. She also, during the banishment, takes a form that it's meant to show the connection between her and the Water (Nenya); and that's why, also for the reasons stated in the previous point, that she becomes a ghostly, dark and blue mermaid with seaweed clothes, totally not suitable and in contradiction with the phial she's holding and its meaning, but at the same time, quite cool and interesting. 3. Galadriel taking a dark and terrible form has somehow become a canon of PJ films, even if it is not very much lore accurate; in LOTR, though, she still takes a dark and terrible form, but she's also majestic and beautiful at the same time (as Tolkien describes the scene in the books), the true definition of the 'Sublime'. 4. About the hidden Three Rings and the fact that Galadriel openly shows and uses Nenya, we have to consider that some important scenes of the Dol Guldur sequence were cut off (thing that I didn't like at all). In the EE we will probably see Sauron interrogating the chained Gandalf about the Three Rings and their bearers, the Three Rings being openly shown and used and a confrontation between Galadriel and Sauron (while Elrond and Saruman are still fighting, after the flight of Gandalf and Radagast) in which Galadriel will take a bright form and will confront Sauron speaking in Black Speech, openly showing and using Nenya. Galadriel is my favourite character, can't you tell?